Delve into the artistic genius and manic depression of singer/songwriter/artist Daniel Johnston to learn about madness, creativity and love. Current footage, vintage performances, home movies and interviews with friends and families draw an intimate portrait of one of the founders of Indie music. Directed by Jeff Feuerzeig. There were three main people who worked on the show on our end, Jesse Nathan, Jordan Bass, and myself, and we all took a shot at writing essays about the work we’d found and included in this show. The first drafts of these essays were a little formal and maybe even pretentious. We re-wrote them and they still didn’t seem right. So finally we settled on the text below, all of it mercifully brief and plain. The show never got much more complicated than that. We started with the artists we knew we had to include: Raymond Pettibon, Tucker Nichols, Maira Kalman and David Shrigley. All four of them had found a place in the fine art world, even though in many cases their work was both narrative and funny, a combination that’s historically been rare in galleries and museums. 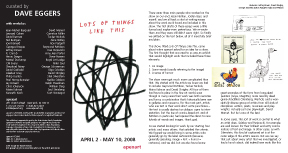 For the most part, artists who use text in their work don’t write punchlines – the text is usually abstract or oblique, open to interpretation. But the rise of comics-based art, and of Pettibon in particular, had opened the doors to new hybrids of words and images, thank god. So we started looking for work by our starting four artists, and many others, that satisfied the criteria. We figured we would bring in some artists who generally go by the label cartoonists (because, generally speaking, image + text + humor = cartoons), and we did, but we also found some great examples of the form from long-dead painters (Goya, Magritte), more recently dead genre-straddlers (Steinberg, Warhol), and a wonderfully diverse group of artists from all kinds of disciplines: writers, poets, musicians and playwrights. Actually just one playwright, David Mamet. But he's one of the best. In some cases, this sort of work is central to what an artist does. Solakov and Perjovschi, for example, are well known for their brilliant and witty combinations of text and image. In other cases, as with Silverstein, this kind of captioned art is at the outer edge of the artist’s oeuvre. But we can say that just about every artist that we investigated, or had a hunch about, did indeed have work like this tucked away somewhere. Long after we had filled the show, we were finding fascinating examples of the form, and of course there are a number of obvious omissions in this show, from Lichtenstein to Picasso. Why is it important to many of the artists that the drawings appear casual, even rushed? Is the loose draftsmanship part of its appeal, in that it seems more intimate and disarming? Is absurdity more appealing when it comes across as humble? What is the line between a doodle, a cartoon, a gag, a work of fine art, and will there ever be a time when someone doesn’t insist on writing a similar kind of silly and rhetorical sentence in an art catalog? Couldn't it be said that these artists are doing lots of not-encouraged-in-art-school things at once, given they’re making work that’s narrative, often informal, un-self-serious and usually featuring punchlines? And given its crossing of these many boundaries, doesn’t it make sense that its practitioners would come from so many other disciplines? Does the subject matter – in many cases private and withdrawn – fit the form of these drawings? That is, is there something shy and retiring about this work, as if you’re looking at something very private, something not meant for public viewing? Is it instructive that a good percentage of the art we chose to put in the show was hard to find? More often than not, we would find something in a book or online that we wanted to include, and when we got in touch with the artist, his or her gallery or estate, they would have no idea where the original was. No one would know. It was refreshing, in a way, and seemed appropriate for the form. Again, it doesn’t take itself so seriously. But it does bring pleasure. This was really the guiding motivation behind the researching and hanging of this show: to put an enjoyable exhibit together, to cover the walls with strange and funny things. In that pursuit, we were lucky to assemble a fascinating group of artists, and we hope you like it. P.S. The ostensible curator, Dave Eggers, would like to emphasize just how hard Jesse Nathan, a very young man who stepped up to help out, worked on this show. A good deal of the most interesting “finds” in the show came via his hard work, ingenuity and creative digging. Jordan Bass at McSweeney’s was a tremendous help, and of course Kerri Schlottman and everyone at apexart were exceptionally professional, good-natured, quick and efficient, and helpful in every way. Dave Eggers is an award-winning author and founder of McSweeney's, an independent book-publishing house in San Francisco. In addition to writing and publishing books, he is a regular contributor about art and music for magazines and has designed most of the books and quarterlies published by McSweeney's, which have been featured in the National Design Triennial at the Cooper-Hewitt National Design Museum and in the California Design Biennial. He also founded and opened 826 National, an innovative tutoring, writing, and publishing nonprofit based in seven cities across the country. Lots of Things Like This is supported in part by the Peter Norton Family Foundation and by the Lower Manhattan Cultural Council with the generous support of The September 11th Fund. apexart's exhibitions and public programs are supported in part by the Andy Warhol Foundation for the Visual Arts, Carnegie Corporation of New York, Edith C. Blum Foundation, Mary Duke Biddle Foundation, Foundation for Contemporary Arts, and with public funds from the New York City Department of Cultural Affairs and the New York State Council on the Arts.